Salmon is the only fish I actually enjoy, eat and can recommend. It’s also one of my top favorite foods to recommend for hair growth. However, thanks to FDA folks approving the selling of Salmon with NO REGULATION. 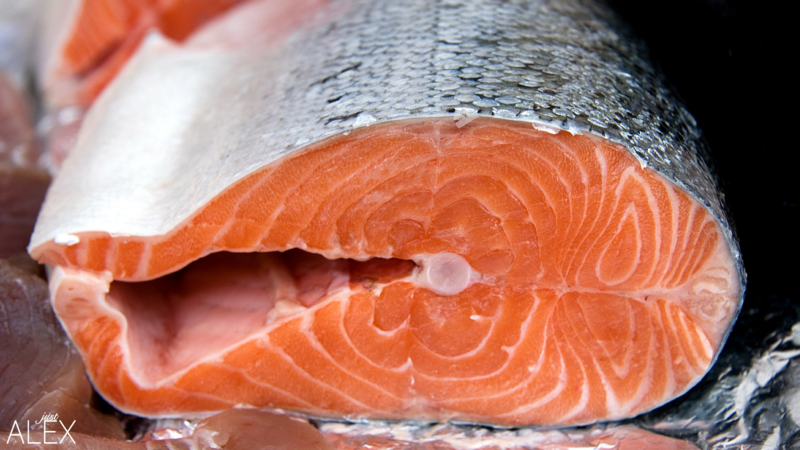 It will be almost impossible now to tell, which salmon is from the ocean, farm or lab. ‪I jumped on periscope to express my frustrations and issues with gmo salmon and the difference in farmed and wild. Take a look at the periscope replay below. This Prevention Magazine infographic shows a great comparison between wild and farmed raised salmon. It’s eye opening to look at the difference in wild verses farmed raised salmon from a nutritional standpoint. You can see more details on the entire infographic and how Wild salmon trumps farmed raised completely by clicking here. I fear GMO/GE Salmon will be along the same lines as the farmed raised salmon. In my periscope rant, I expressed my opinions on GMO salmon compared to what has happened with Farmed raised salmon. In general I hope that things are labeled so that we can be better informed as a consumer. Personally, I will not purchase the GMO salmon and have moved towards a meat-free diet for a bit. But I eat according to my body and plant based. This was a great post! Sharing!